This original painting is a romantic expression of a favourite subject and one of a kind. 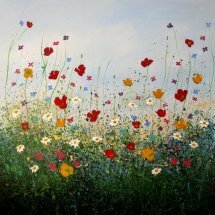 There are many wild flower meadows in the High Peak and there is so much inspiration for creating floral paintings. I love flowers and they are always a lovely reminder of Summer. I have created strong contrasts by layering dark tones with lighter colours so the effect is of bright jewel like intensity. Painted in high quality acrylics on a deep edged canvas, "Honey Heaven" is ready to hang. 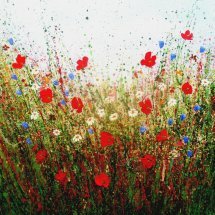 I use impasto techniques applied with a palette knife, brushes and other mark making implements, which creates a contemporary painting effect. The edges are painted white.